During my pregnancy I used Hypnobabies Home-study starting at 30 weeks with 5 weeks of maintenance and an in home Birth Rehearsal with a local Hypnobabies doula, my non Hypnobabies doula and my husband. I saw a chiropractor throughout my entire pregnancy and followed suggestions from my midwives on herbal supplements and vitamins to take in order to help my uterus, cervix and to stay low risk. I did exercises provided by my chiropractor and Spinning Babies daily. On Thursday morning June 8 around 9 am I passed my mucous plug. I had dull pressure in my lower abdomen similar to a period. I went on a walk with my toddler around our very hilly neighborhood and then came inside to rest. Around noon the pressure started to become more noticeable and consistent. I reached out to the support group and agreed it was time to start my Birthing Day Affirmations, Fear Clearing and Deepening tracks. My husband took me to get a prenatal massage where I continued to have my mental light switch off during the massage and continued listening to my birthing day playlist. I had 7 pressure waves during the one hour massage. I also had my weekly follow up appointment with my midwives this day so after my massage I put my light switch on center, grabbed some lunch (greasy fast food lol) and then went in to see my midwife. My water broke while I was at the appointment around 4 pm and my pressure waves were consistent but still very faint about every 10 minutes. I refused vaginal checks so I am not sure how many cm dilated I was at this point. We went for a walk at the park, went to dinner, came home and showered and slept for 4 hours. All the while my switch on center except for when I was sleeping I turned my switch off and then to center to drink water (I had about 16oz every 2 hours) and to use the restroom (which was about every 30 min-an hour. Around midnight the pressure waves were coming every 6-7 minutes and building up more noticeable pressure. 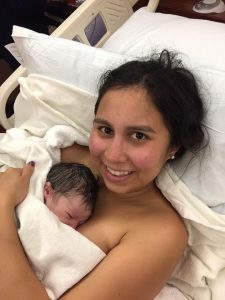 My midwife and doula agreed it was time to go in to the hospital. *side note: my first birth was 6 hours long total and moved along very quickly so we wanted to have enough time to get settled in the room at the hospital. I showered again to relax from the excitement of finally going in and continued to drink water. We got to the hospital around 12:30 am where we met our doula. I was apparently the only momma there that night and it was great to be able to just walk right in to my birthing room and quickly get back to turning my switch off. It was frustrating to have to turn my switch to center because they insisted I had to be the one to answer certain questions but thankfully it was still early on when my waves were 7 minutes apart. My midwife came in to see me and suggested doing a vaginal check to see if my son had resealed my water and we agreed. She was so wonderful and used Hypnobabies terminology and was very gentle with her suggestions. I was so thankful to have her on our team that night. Sure enough his head had created a seal and she had to “break my water” she allowed me time to turn off my switch and when she was done the waves really got going! It was incredible! We got the room ready with dimmed lights, fake battery candles, ocean waves (my special place I was surrounded by the sound of waves), essential oil diffuser, rebozo scarf draped over me, and my doula used peppermint essential oil to ease my nausea. Per hospital policy, I had to be on a monitor for 30 minutes. After drinking some juice, eating some candy and fruit-baby finally gave them what they wanted to see and I was allowed to come off the monitor. I enjoyed this so much as I was able to dance around the room swaying my hips and then turning my switch off while my husband and doula supported me. I also enjoyed rocking and bouncing on my birthing ball, using rebozo scarf to do abdominal lifts and getting on all fours to rest. I continued using the restroom A Lot! I don’t remember using the restroom this much with my first but SPOILER ALERT ? baby was OP! So as my midwife was saying-my body was making more room for baby to pass through! As the waves continued to build up my doula had me get in the shower and when the waves came I would either do a deep lunge or a deep squat. In between I really found comfort in swaying from side to side. My team was incredible at following my cues and reminding me to Deepen, Open, Relax, send Peace and they would say a deep “ahhhh” with me as I was having waves. They were also ready with refreshing ice water in between waves since my mouth was so dry from the deep “ahhh” breaths. My doula was so incredible (she was with us during our first born too-which was a non Hypnobabies water birth)-she really went into action applying counter pressure and using rebozo to wiggle my hips during waves and doing abdominal lifts! (Different techniques I’ve seen on spinning babies that she is familiar with and they felt amazing)! I will share and please have your Bubble of Peace ready for this: but I had a moment of weakness during my transformation which came on very quickly and very intensely that I said I didn’t like it and wanted to lose it. I voiced this but my team continued to encourage me using hypnosis cues and helped ease me back to focus. It was only 3 waves of self-doubt but we overcame and allowed the pressure waves to open, release and allow baby to move down. 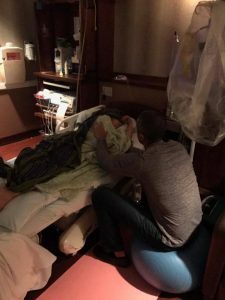 I continued having deep pressure in my bottom and continued to use the restroom, I also vomited during transformation (all of the fruit I ate while I was swaying in the shower at the hospital) and then the felt a strong urge to push-so I did! I was in the tub at this point-it felt amazing to have a heavy hot compress on my lower back and a cold small wash cloth around my neck and face-both of which were my doula’s idea. My midwife asked to do one more vaginal check and I said okay I was 4cm during transformation. I continued to gently let baby move down and my team and I kept repeating “Open, Open, open” next 20 minutes or so baby’s head was visible! My midwife was going to do a 3rd vaginal check but baby’s head was so clearly visible she said okay never mind let’s meet this baby ??! I let the wave build up and alternated each breath saying deep ahhh’s and holding my breath to push-like we discussed on here before whatever felt right to me in the moment that’s what I would do. When his head was applying pressure just before it came out, I asked my midwife to help me by applying counter pressure around my perineum. I turned around from being in a forward leaning squat to leaning back on my husband reaching my arms up behind me and around his neck to push baby out. We took rests in between to allow stretching and the actually pushing/getting baby out was my favorite part of this entire journey. When I started feeling the urge to push my doula turned my speakers up so I could hear my Pushing Baby Out script on repeat-I loved this! I needed a lot of reminders repeatedly (like I said before I had a present weakness that I was struggling to overcome). He was gently born into my hands (my midwife had encouraged me to bring my arms back down so I could catch my baby). My team also had to help keep my lower body under the water because I kept floating to the top and it was very important for baby’s head and body to stay in the water. To everyone’s surprise baby was facing sunny side up! But I’m telling you the only thing I could think back on signs of OP was the strong urges to push and having a lot of bowel movements. Also-during waves I wanted to lean forward or into deep lunges slightly leaning forward. We delayed cord clamping, I decided to birth my placenta in the bed and we latched on for the first hour skin to skin. I did not have any tearing and was sent home the next day around noon! I did take a Motrin for the pressure after birth but haven’t needed any ever since. This babe of mine (just like my first) is cool calm and collected. We have yet to hear him cry and he gives me plenty of warning that he is hungry. Thank you Hypnobabies for such a wonderful enjoyable experience that I will never forget! ??? ?